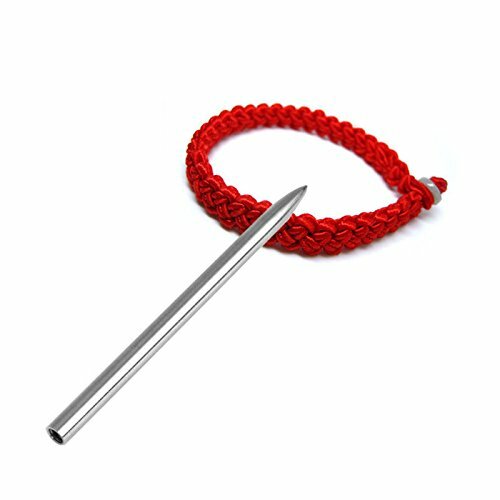 3'' Inches Steel Paracord Needle With Screw Thread Shaft Tip Stiching Needle Fid by princessdress08 at Kerinci. MPN: 7107688051430. Hurry! Limited time offer. Offer valid only while supplies last. Description: 100% brand new and high quality Long & light-weighted, easy to handle. Work well with Paracord & leather laces. Can be used to lace up hand sewn boat shoes, boots and necklace. These needles were manufactured specifically to be used as paracord stitching needles. These needles are made with deep threads to provide a positive grip on your paracord. This allows for greater ease of threading through tightly woven weaves, braids, or knots. Fishing: Polishing on ths surface. Material: Stainless steel Length: 77mm/3'', Thickness: 5mm/0.02'' (approx) Color:Silver Quantity: 1 pc Note: No retail package Please allow 1-3mm error due to manual measurement. pls make sure you do not mind before you bid. Due to the difference between different monitors, the picture may not reflect the actual color of the item. Thank you! Item will be shipped from China, need 20-30 days to deliver. If you have any questions about this product by princessdress08, contact us by completing and submitting the form below. If you are looking for a specif part number, please include it with your message.